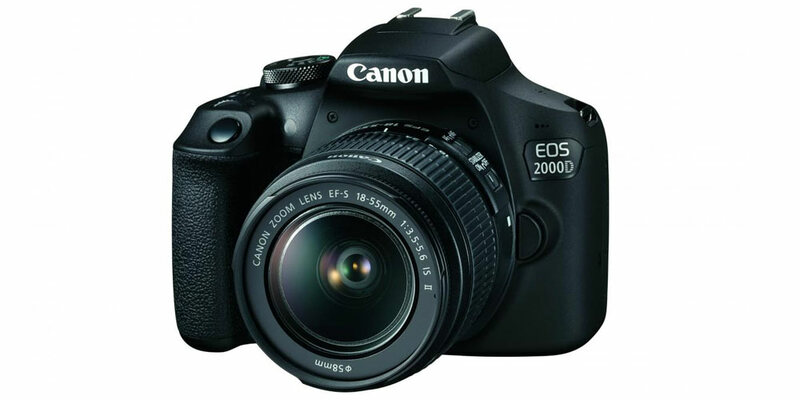 The EOS Rebel T7 or EOS 2000D is an upgrade from the EOS Rebel T6 / EOS 1300D. This is an entry-level DSLR with a low price point, making it an ideal solution to step into not just the DSLR world, but also with Canon themselves. Being an entry-level camera, the feature set is much reduced, but is it still worth the money giving you the flavor of something better for the price. Being cost conscious, you wouldn’t expect the latest and greatest tech in this camera body, but you would expect semi-up-to-date. This camera model can be, at times, a fine line. There’s a 24.1MP sensor, which isn’t the same one as in the likes of the EOS Rebel T7i, but the older type as in the EOS Rebel T6i. The DIGIC image processor is now on it’s eighth version, but it’s the DIGIC 4+ which is used here. 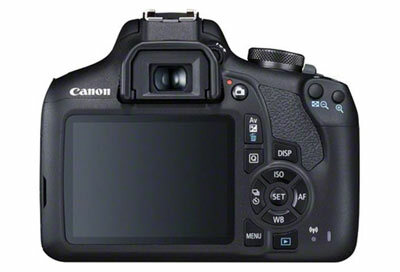 The other older features are 9-point AF system, same rear display as the EOS 1300D and unfortunately no touchscreen. There’s also no 4K video here, but that’s not really a surprise when you consider higher up models don’t even have this feature. This doesn’t mean you’re getting antiquated technology per se. There’s Wi-Fi and NFC connectivity, but you have to expect more basic features at this price point. The changes on this camera are minor compared to the previous model inside, with the outside being the same layout of buttons and dials. A good thing for Canon users, making it easier to jump from one model to another. The body has a very plastic feel, slightly smaller in dimensions from its higher end siblings, but still enough front grip to keep your hands around the thing. A nice feature would be to adopt the graphical interface from the Rebel T7i, but it’s still simple to follow things with the in-camera feature guide. It’s also a shame there is no tilting screen or touchscreen facilities, but you can’t have everything. 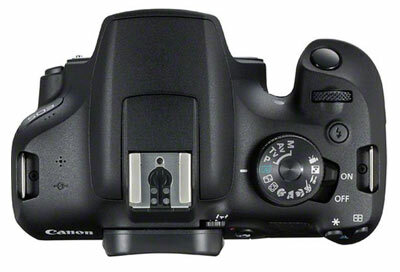 The Rebel T7 keeps the now dated 9-point AF system as found in the EOS Rebel T6. This will mean that the focusing will be very center weighted and start to become more sluggish in lower light. This is due to a single cross-type sensor in the center of the AF points. Live view really slows things down with autofocus to the extent that you simply use the optical viewfinder. This, in a strange way, works as a benefit since, as a beginner, you steer towards the viewfinder and its readouts being the majority of your regular shooting experience anyway. The battery life is around 500 shots, which may seem only okay compared to similar entry level DSLR cameras, but it’s not that bad a number compared to an entry-level mirrorless design. As always, the law is always to bring spare batteries, no matter the camera. The upgrade from the 18MP sensor to the 24.1MP APS-C is a definite improvement, even though the sensor is the older type. The amount of noise throughout the ISO range 100-6400 (H: 12800) is actually less than expected. Raw files give you more scope with noise starting to creep in around ISO400, while JPEG files starting to soften at high ISO levels due to the built-in noise reduction. Raw files will also let you recover details in the shadows and highlights to a reasonable amount, but don’t expect more than a stop or so of extra movement. The Metering is handled by a 63-zone dual-layer metering sensor, not the one in the Rebel T7i, but it does a reasonable job, especially in Evaluative mode. The other modes being Partial, Centre-weighted and Spot metering. It works reasonably well, but it works the best in reasonable light conditions and don’t expect a fast burst rate as you only have 3fps continuous. Many have bemoaned this as far too low a continuous burst rate, but you have to consider as a feature on an entry-level camera the priority for the beginner is to capture perfect frames, so although high burst rates are great if you want action shots, this is more considering the entry point of the camera. If you want a budget camera primarily for action or events, you may have to look elsewhere. Video comes in at 1080/30p and gives clean and crisp footage. There’s no advanced features here, but it will allow you to dip your toe into using video with interchangeable lenses and getting used to manual focusing and exposure. Files are outputted as either .mov or MPEG4 AVC/H.264. This review of the EOS Rebel T7 may seem negative at times, but everything has to be considered under the umbrella that this is an entry-level camera, trying not to tread on the toes of other Canon models. It’s a definite upgrade from the 1300D, but only in small areas. The jump in resolution from 18MP to 24.1MP definitely makes a difference, but the feature set elsewhere largely remains the same. This means that it’s got some serious competition from other entry-level DSLR makers, that definitely offer more for the money. Maybe Canon were banking on the resolution jump to be the sole factor that sold this camera, but we really need more for our money these days. A slightly better AF system, including the Dual Pixel CMOS AF would have made this a more exciting proposition. Inclusions of a rear screen, which was tilting and touchscreen and the more beginner friendly interface could have made things a lot different. Definitely making the camera measure up better against the competition. If you look at the likes of the Nikon D3500 the camera has a robust AF system, great image quality and a battery life good for 1200 shots. There’s also the Sony Alpha A6000, which has been superseded by the Alpha A6300 and Alpha A6500, but is a great entry-level mirrorless camera with some robust features. There’s also competition from Canon’s own line up from the Rebel SL2 which has the Dual Pixel CMOS AF and a touchscreen, along with the 18MP EOS 4000D. The 4000D with a kit lens is one of the lowest prices around, but the EOS Rebel T7 is a definite preference. The EOS Rebel T7 is definitely a good entry-level DSLR, which will give you a flavor of the features found in higher end models, you just have to make do with some of the functionality been quite a few years old. You may outgrow this camera body quite quickly if you investigate all its features and with a lot of entry-level competition around, this model will need some serious upgrades in its next version. Previous Post« Previous Olympus OM-D E-M1X to Begin the Company’s Centenarian Celebration?